Posted on July 7, 2006 by Alicia Bay Laurel	in Blog. 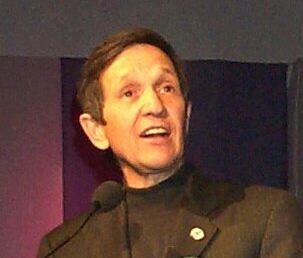 As I wrote in my recent story about the voter fraud meeting, our new Kucinich Democrats overwhelmed the caucuses in February 2004, and they elected a lot of us early organizers as officers of our precincts. We went on to bring an impressive panoply of progressive resolutions to the state Democratic Convention. Of the nine I wrote, eight passed at the convention and one is a law now. We all felt that, more than simply supporting Dennis, our mission was to promote the issues that he did, not because we were following him, but because he truly represented us. decision for the next president. But he is building permanent bases in Iraq; and he is determined to keep a force of at least 50,000 in Iraq into the distant future. This Congress may not bring an end to this war. Because the real power to end the war is in a cutoff of funds. Congress keeps appropriating funds in the name of the troops, and the troops will stay in Iraq instead of coming home. Only the American people can bring an end to this war, as they brought an end to the war in Vietnam. There were no weapons of mass destruction in Iraq. But there are WMDs in DC. Lies are Weapons of Mass Destruction: 2,500 American soldiers have died. Over 100,000 innocent Iraqis have died. It is a time for an end to our national sleep walk through the graveyard of the Iraq war. teach-ins, for meet-ups, for marches, for rallies about the war to begin at college campuses, at churches, at labor halls, at libraries. Time to gather in civic centers, in town halls, to discuss the truth about this war, and to plan civic action to end it. It is time for the American people to exercise their First Amendment rights to stand up, to speak out. Time to redirect the policies of this country. Time to learn and practice peaceful, nonviolent conflict resolution. Time to believe in our capacity to evolve beyond war. To believe, and act upon the belief that war is not inevitable, that peace is inevitable—if we are ready to commit to the daily work of peace building everywhere. The Global War on Terror has become a Global War of Error. Attacking or threatening countries which did not attack us. Bombing neighborhoods to save neighborhoods. Committing atrocities in the name of stopping atrocities. Losing our vision, losing our way in the world, sacrificing our children and their future, giving up their future resources for education, for health care, for housing, piling it high on the altar of war. Worshiping a false god of destruction. When we begin these proceedings with this remembrance: “Thine is the Kingdom, the Power and the Glory,” we are not talking about any nation, we are talking about a Force which is above all of us. The world is not ours to conquer. There is no glory in the abuse of power. The President will not bring an end to this war. This Congress will not bring an end to this war, absent the Murtha Resolution. But the American people will certainly bring an end to this war. They will do it in the streets. And they will do it at the ballot box. The American people will become the Out of Iraq Caucus.